Richie Shaffer and Cory Brown hit back-to-back home runs in the 6th. In the 7th, after Taylor Motter double home Hak-Ju Lee and Tim Beckham, the Bulls went back to back again when J.P Arencibia homered and Richie Shaffer (again) homered in three more runs. The Knights brought in five runs on small ball (and ineffective Bulls relief pitching) in their part of the 8th and the Bulls answered with some small ball of their own in the 9th. It got scary in the bottom of the 9th when you’d think things were well in hand with a 10-6 lead. But the Knights were listening to the same song, I guess, because they led off with back-to-back home runs before Kirby Yates got back in control. All-in-all an impressive night for Bulls hitters and Mr. Hagens. Not so much for the Bulls relief crew, who had been stretched out on Tuesday. None of the three who followed Hagens were on their game, but José Dominguez in particular has not been on his game all year. Not sure why he remains on the Rays 40-man. 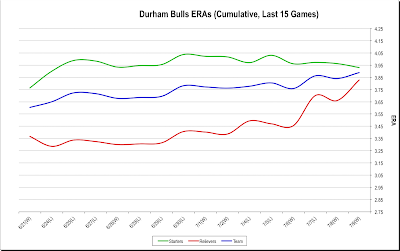 He’s averaged less than an inning per outing as a Bull (14 appearances, 10 innings) and has little to show for it (ERA-7.20, WHIP-2.30, FIP-4.80). He had some good outings with the Rays back in mid-April, but he has not brought much to Durham. Richie Shaffer wowed the home town crowd with a 4 for 4 outing (and an intentional walk in the 9th). Charlotte was where he spent the winter putting on a lot of muscle with obvious results. In his brief time in the IL so far he’s hit 14 home runs and is tied at #2 for the entire year (teammates J.P. Arencibia and Corey Brown are tied for first with 15). Dan Johnson is back in the bigs. Long time WDBB favorite, Dan Johnson is up in the majors as a first baseman for the St. Louis Cardinals. Durham writer Adam Sobsey has a nice piece on his return in yesterday’s Grantland. 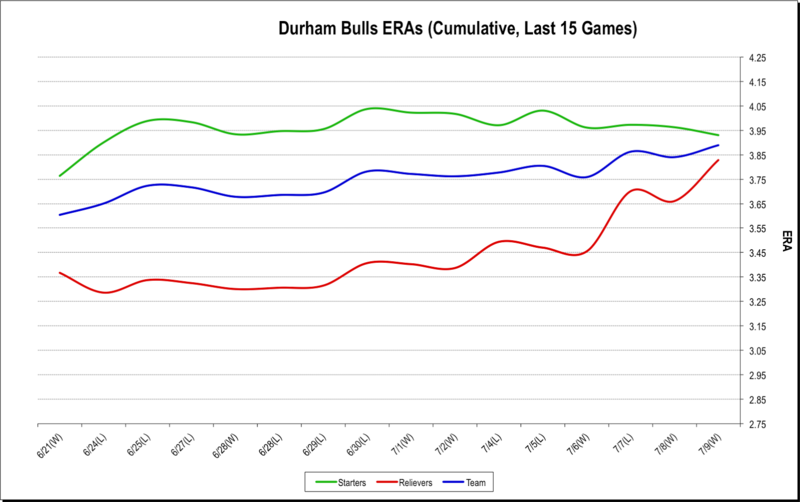 DJ was high on our all-time hitters list for his performance over three seasons as a Bull (2008, 2010, and 2011). This year he started with the Louisville Bats in the Reds system then free-agented over to the the Cardinals system and the Memphis Redbirds. Good luck, Dan. Last time we looked it was the starters to had us worried. Now the bullpen trend is very worrisome.